I Love Afterschool Because . . . This month, we’re celebrating the millions of reasons to love America’s afterschool programs, and we want to see why you and your students love afterschool! Joining in can make for an easy and fun activity for your program in the days leading up to Valentine’s Day. We’ve already seen programs in Washington and Alaska invite students to participate, with some unique and creative results. Make copies of the included We Love Afterschool sign. Ask students (and parents!) to fill them out. 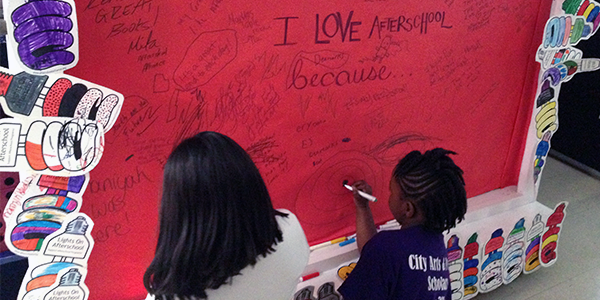 Snap photos of the finished product and share them on social media with the hashtag #AfterschoolWorks! Ready to get started? Download the toolkit now.